Have you considered using Eiffel tower vases for your tall wedding centerpieces? If not then you should definitely look into it. 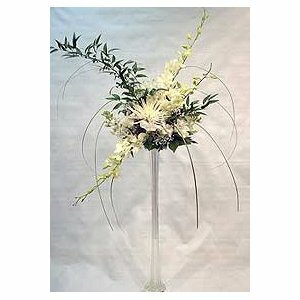 They are great for holding popular flowers such as cascading lilies and orchids. They come in different sizes but no matter which ones you choose, they will definitely help to add a touch of elegance to the table. When shopping for a good Eiffel tower style vase, you should opt for one that is bottom heavy. As the vases are tall, the chance of them falling over when something is placed in or on top of them can be quite high. Therefore you need to ensure that they are sturdy at the bottom if you don’t want to risk breaking them. You will also need to consider whether you will be placing a large floral bouquet on the top of the vase. If so then you will also need to invest in containers. These sit on the top of the vases and they will hold a flower bouquet no problem. When you are purchasing tall vases, you should also consider what will go with them. Candles often go great around a tall vase and they can really complete the look. Choose flowers that cascade over the vase, but make sure that none of your guests are allergic to them. That could be a potential disaster! Lillies for example have a very strong scent. This could bother some guests, especially if they will be eating. You should also be wary of choosing a tall vase that your guests will not be able to see over. They will want to be able to comfortably talk to people across the table from them without having to lean around the vase. If you keep these things in mind then you will end up with the best Eiffel tower vase centerpieces to suit your reception.